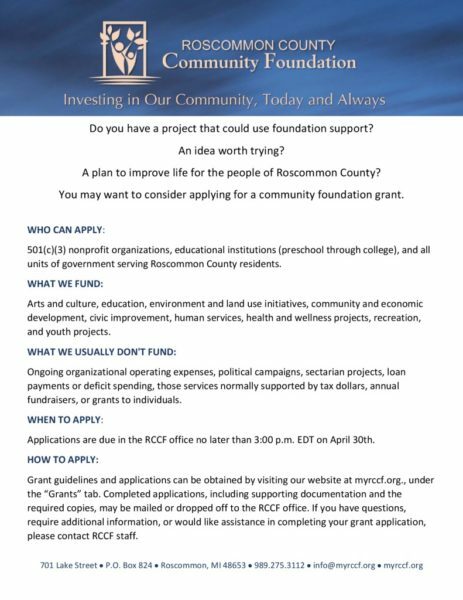 The Roscommon County Community Foundation (RCCF) is pleased to announce they have awarded their third #CommunityChoice Grant to The A.R.K. (Association to Rescue Kritters). The A.R.K. was nominated by the community, and ultimately received the most “likes” resulting in a big win for their organization. The A.R.K. was presented with a $1,000.00 grant funded by the Ambassador Club Fund. The A.R.K is dedicated to the rescue, rehabilitation and release of injured and orphaned wildlife. Approximately 825 birds, mammals and reptiles were admitted for rehabilitative care in 2017. The A.R.K. plans to use the funds from the #CommunityChoice grant to help support their project of removing and trimming about 38 trees that have been infected with the oak wilt disease. This project is crucial not only for the safety of volunteers, but for the safety of animals and anyone who visits the property. According to Executive Director Ruth Fruehauf, there is just “too much at risk” with the chance of falling limbs and trees that could injure animals and volunteers or damage cages and structures on the property. Inspired? You can support the Ambassador Club Fund by sending your donation to RCCF at P.O. Box 824, Roscommon, MI 48653 or visiting our website at www.MyRCCF.org to make a donation online. Pictured L to R: Back row stairs: A.R.K. Board & Volunteers, Mary Fredrick, Patti Moreau, Pat VanOosten, Kathy Hedrich Trustee, Karen Noggle, Randy Fierke Treasurer, Debbie Blanchard Secretary. Holding big check: Charlie Blanchard Trustee, Ruth Fruehauf A.R.K. Executive Director, Katie Dunaj Vice President. Far left: Jim Clabuesch Trustee, Anita Sheppard Trustee, Tom Moreau Honorary Board Member, Susan Tyer Vice Chair, Scott Rice Trustee, Diane Nielsen Secretary, Sara Morley LaCroix Trustee, Mike Burnside Treasurer, Kathy Lawrence Trustee, Brent Cryderman Chair, Suzanne Luck RCCF Executive Director. Front row: RCCF Ambassador Club Members, Christine Dunaj MidMichigan Community Health Services Marketing Specialist/Executive Assistant, Ann Bolzman HLF Executive Assistant, Vicky Springstead HLF Chair.